Skyline's Zach LeDay (32) aggressively blocks the shot of Jesuit's Jeff Schoettmer (11) during a high school basketball game at Jesuit High School in Dallas on Feb. 7, 2011. 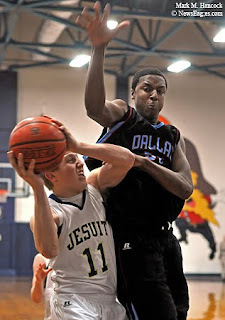 Skyline battles Jesuit during a high school basketball game at Jesuit High School in Dallas on Feb. 7, 2011. Named in this slideshow are: &nbsp Blake Vierling, Will Barrow, DeVante Kincade, Zach LeDay, Jeff Schoettmer, David Lacey, Stephen Spieth, Shirmane Thomas, Will Thompson and Stephen Olson. 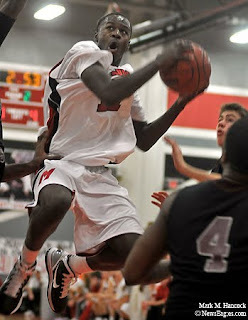 Flower Mound Marcus junior A.J. Luckey (11) leaps before Plano senior Julian Okoro (4) during a high school basketball game at Marcus High School in Flower Mound on Jan. 4, 2011. Flower Mound Marcus battles Plano during a high school basketball game at Marcus High School in Flower Mound on Jan. 4, 2011. Named in this slideshow are: Terrance Cooper, Connor Taggart, Nick Banyard, Dwayne Hicks, Clayton Parlin, Austin Bianco, A.J. Luckey, Julian Okoro, Phillip Forte and Marcus Smart. Woodrow Wilson junior Andre Plata (33) and Melissa freshman Jackson Webb (13) dive for a loose ball during a high school basketball playoff game at Ellis Davis Field House in Dallas on Feb. 19, 2011. 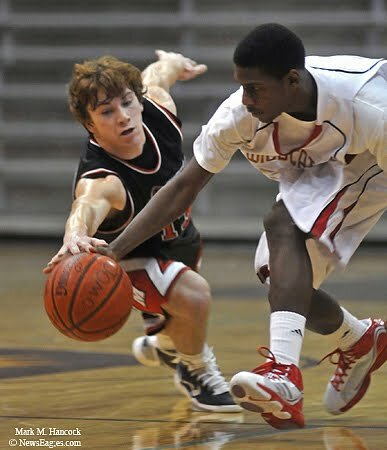 Woodrow Wilson battles Melissa during a high school basketball playoff game at Ellis Davis Field House in Dallas. Woodrow Wilson won 68-53 and advances. Named in this slideshow are: Justin Daniels, Hondo Webb, Ian Hatfield, Andre Plata, Zach Helmberger, Ryan Ragon, Dearius Wright, Michael Vickers, DJ Brown and Jackson Webb. One hard-working PJ/reader is about to EARN an Urban Disguise 50 V2.0 laptop/camera bag valued at $179. In honor of this blog’s 2 millionth milestone (not really, but it’s a happy coincidence), the good people at Think Tank Photo have offered the rockin' prize posted above. Rather than a regular (subjective) PJ contest for the best quality images, this contest is for hard-working PJs. Let’s reward the PJ who works the hardest on all the subjects a PJ should do each week. A shopping list of PJ subjects is posted below. To win this prize, a PJ must be the first to shoot and post links to ALL of the subjects*. 1)	The subjects must be shot on or after August 9, 2011. 2)	All photos, videos, slideshows and captions must be posted to publically-viewable locations on the Web (newspaper website, blog, portfolio websites, etc.). The spot news photo MUST be on a news site (it must be vetted by an editor). 3)	PJ must shoot and post links to ALL subjects listed below. Simply cut-and-paste the list into the comments section and add a link to EACH example of YOUR work. Each subject and/or link may only be entered in one category below. Only entries submitted as comments for this post will be considered (no e-mail). Again, contestants can only enter ONE entry in the comment section of this post with ALL subjects and links in the ONE post. The post should have exactly 13 links. 4)	Each image link must have an appropriate photo(s) and/or video for the category and a complete cutline (names, dates, locations, etc.). 5)	All entries will be time-stamped by Blogger when the entry is submitted. The first to complete the PJ challenge wins. 6)	Once a winner is determined, the winner must be willing to e-mail their personal information to me for Think Tank Photo to mail your prize. 7)	Mark M. Hancock is only responsible for verifying the completion of this challenge. The winner is subject to any additional rules required by Think Tank Photo (I don’t think there are any, but I’m covering all bases). 8) PJ's only provide links to the images/videos as evidence. Copyright owner(s) keeps all rights. Please see the Labels section of this blog to clarify terms. Good luck and get to work. Kirk Taylor of Dallas scales a wall during a climbing session at Exposure Indoor Rock Climbing in Carrollton on June 23, 2011. 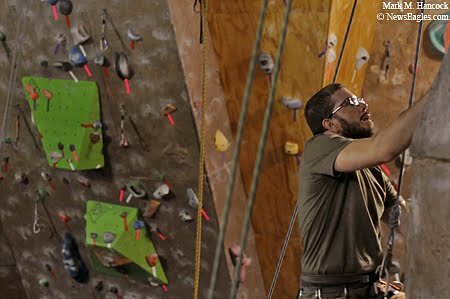 Climbers get a workout and staff demonstrate additional exercises at Exposure Indoor Rock Climbing in Carrollton. Rock climbing provides a whole-body workout for participants. Named in this slideshow are: &nbsp Tadd Jensen, Kirk Taylor, Paul Soutner, Chris Castrianni, Pat Roscovius, Kit Sinclair and Zach Marsh. Please read "Rock climbing offers workouts for all body types" (subscription required) by Caitlin Johnson / The Dallas Morning News.